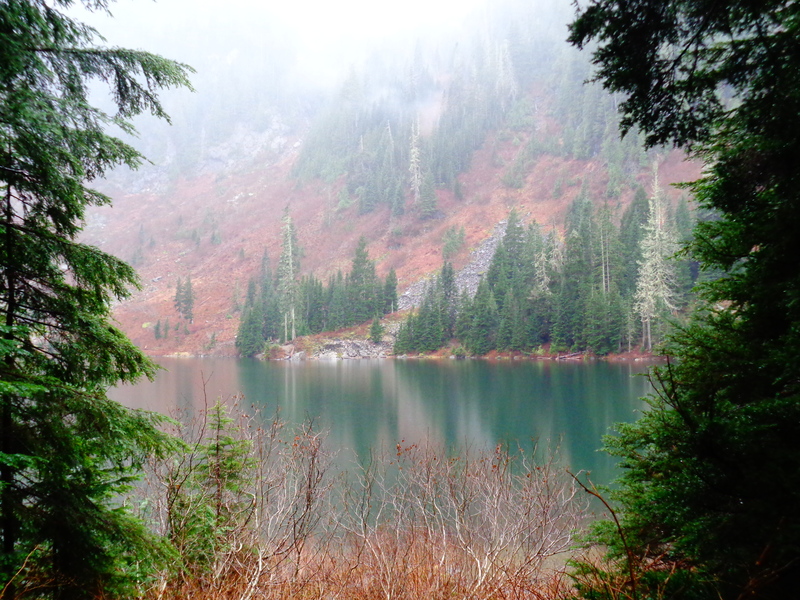 Lake Twentytwo is another mega popular hike for everyone in the entire state of Washington. The last time I was there, we got kicked out of the parking lot because it was full and cars that had parked alongside the road were being ticketed and towed. So I figured okay, on a rainy Friday in mid December, I should be able to find a spot. Or have the whole parking lot to myself. Well I ended up having to share the parking lot with four other cars. I can deal with that. 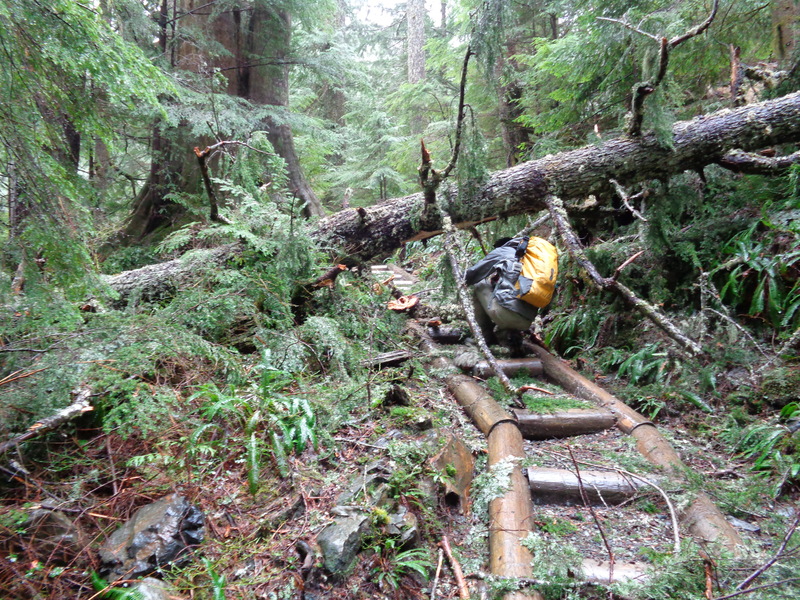 There had been a big wind storm the night before, and we weren’t sure what to expect on the trail. Driving to the trailhead we had passed trucks cleaning up the downed trees (we had to drive under a few) across the highway, so we figured there would be some damage on the trail. The parking lot is just a few feet off the highway, so we knew gravel roads weren’t a concern. It was raining when we started, but just a light drizzle. My Arc’teryx rain jacket (beta AR) had arrived, and I was excited to test it out. The wind storm had been a big deal. Sounds like California had it the worst, but we had gusts measured up to 77mph in urban areas, nevermind out in the mountains. Six stories of scaffolding blew over in Ballard! As for trails, there were definitely some blow downs. Trees that fell over and splintered into millions of pieces. The air smelled like freshly cut wood when you got close to one, and sometimes it just looked like the trail disappeared until my brain registered that it was covered by tree debris. You could climb over/under all of them, but the trail is going to need some serious work. I know the Seattle Mountain Running Group told all their runners to get the saws out Friday morning and meet up to give back to the community since we spend so much time on the trails. I pictured a bunch of trail runners jogging along trails with chain saws to take care of stuff like this. I’m sure that’s what happened. 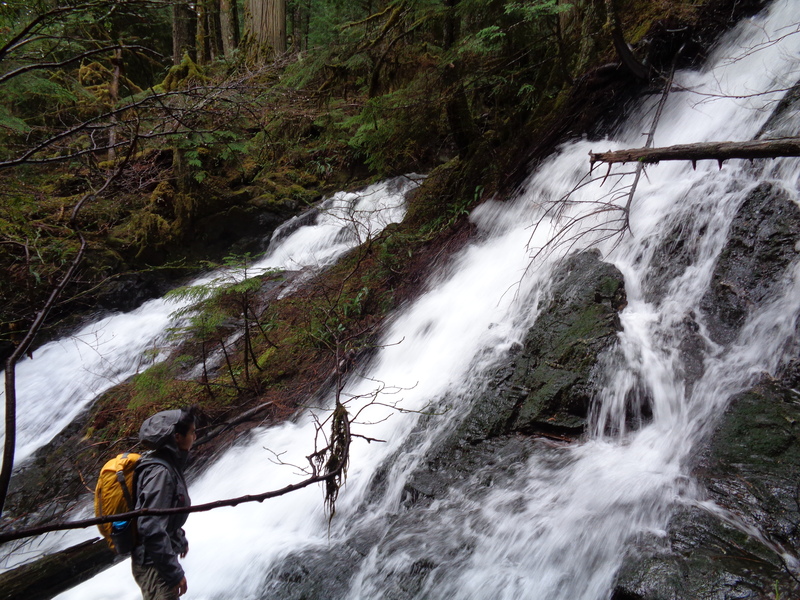 In addition to the downed trees, there were tons of waterfalls along the trail! I hadn’t expected them, so it was a pleasant surprise. Honestly I had pretty low expectations for this hike. Which is what I always do with short, popular hikes. The best views are typically on the longer, more remote hikes, so I never get hopes up for the “mainstream” treks. Setting those low expectations means I’ll never be disappointed, and my logic with these hikes is that it’s just good to get out and get some fresh air. There weren’t many places to take decent pictures of the waterfalls since they were all off-trail, but it was neat climbing down to look at them and hearing them the whole time. There was one point where you cross one on a bridge, and Jonathan took a long-exposure picture which will hopefully come out well. Things I wish my camera could do. 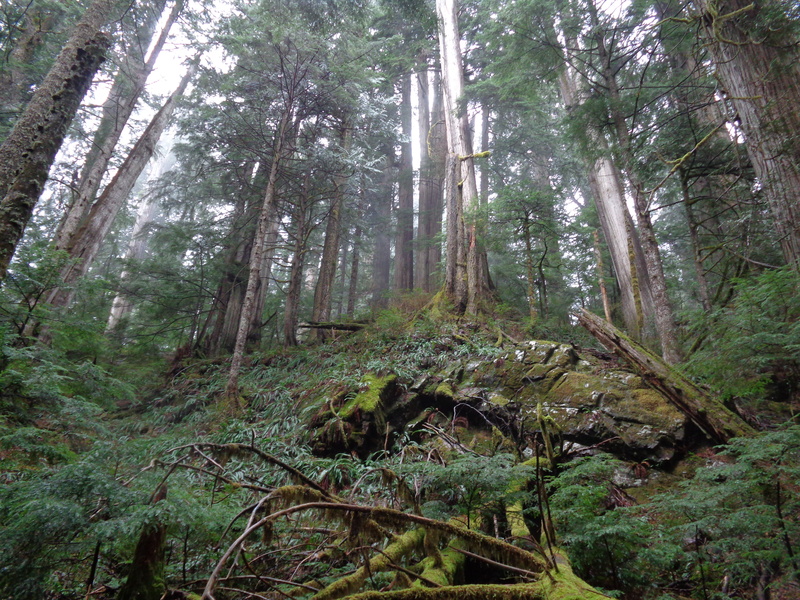 The forest in the area is an old growth forest. 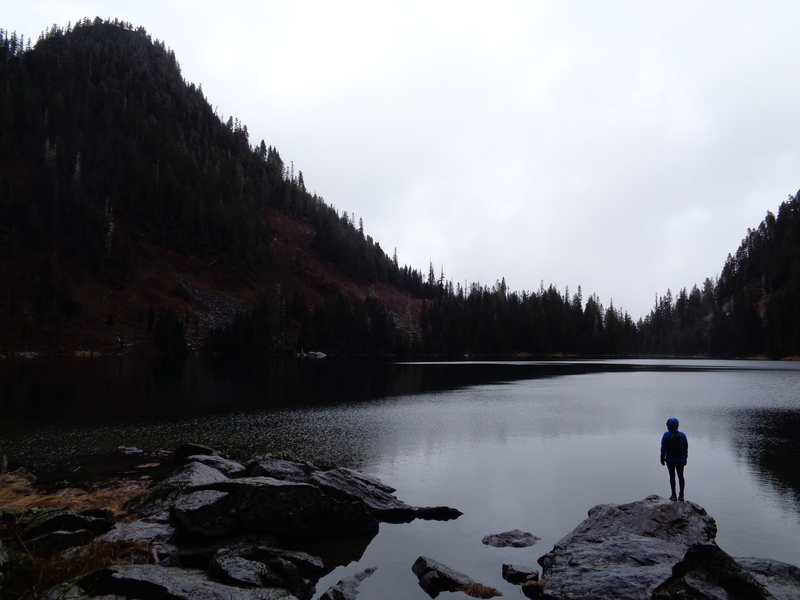 This hike is very close to Heather Lake, the first hike I did in Washington with my roommate and our mothers. It was a rainy day, and the forest looked amazing in the clouds .So I expected similar foliage, but Heather Lake seemed older and greener. That could be a side effect of seasons, since I was at Heather Lake back in August. 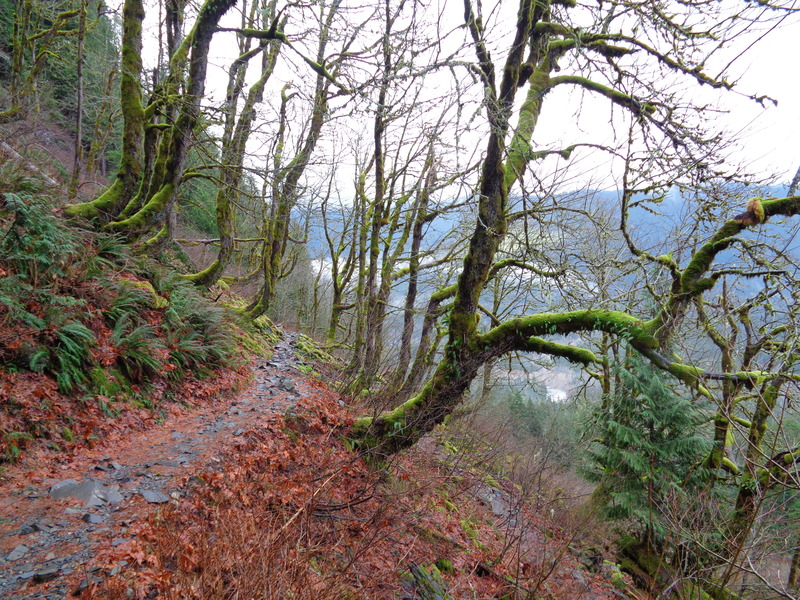 Either way, both are fantastic cloudy day hikes, since fog and rain just enhance the experience when you’re surrounded by enormous trees and carpets of moss. Those are ferns. 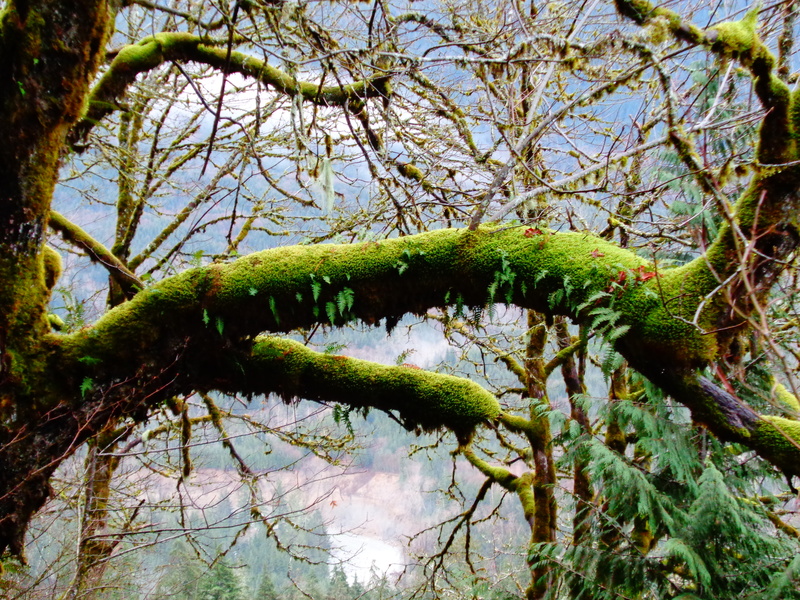 There were ferns growing out of the moss that was growing on the tree branch. You can’t tell, but the ferns were almost a foot long. Where I come from, everything is gray and dead by December. There aren’t plants growing from other plants and being so green. Everything out here is so damn healthy. Finally we reached the lake! We had some tea (seriously, hot tea in a thermos is a game-changer for any winter hike) and snacks under a tree, and then went to see if we could hike around the lake and take some good pictures. Jonathan brought his go pro so we toyed with that for a bit, tying it to a selfie-stick to get a few pictures. The clouds were pretty low when we got there so we couldn’t see the peaks, but like I said, sometimes that just adds to the scenery. There’s a boardwalk that wraps around the entire lake. Mt Pilchuk rises opposite where the trail meets the lake for the first time, and there were tons of thin waterfalls cascading down the rocks. I wonder if anyone goes rock climbing up there. 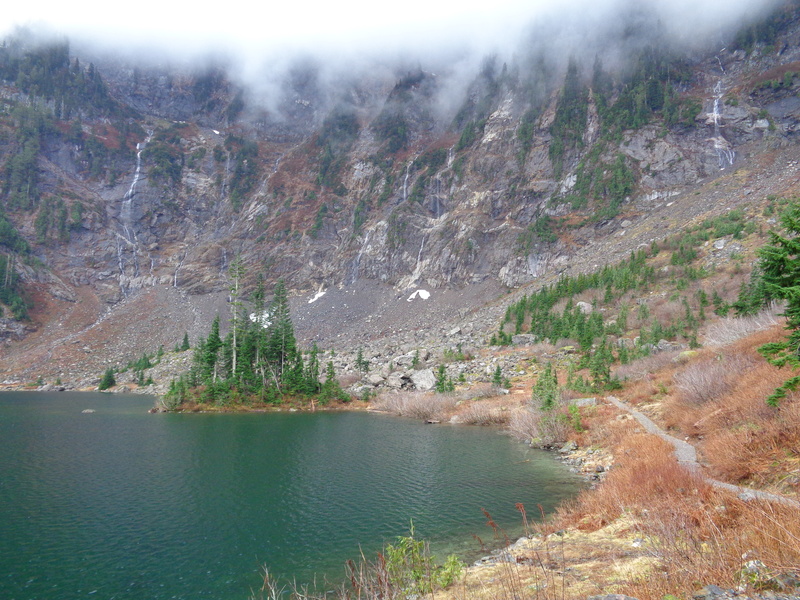 We followed the boardwalk to the opposite side of the lake, under the sheer rock face. I’d love to see this covered in snow. According to wta.org, it does get snowy enough sometimes to risk avalanches, especially along that back side beneath Pilchuk. We hung out at the top while Jonathan took a time lapse of the clouds with his ‘real’ camera. Thank god I had bought mittens and brought tea, or I’d have been freezing. I ran a bit for a few photos which helped keep warm too. Oh, and how have I not mentioned the arc’teryx jacket yet? It was phenomenal. I was so dry. So dry and so happy. It definitely keeps you a bit warmer too. It pretty much creates an entire micro-climate around your body since (as much as they say it’s breathable) it holds almost everything in. It’s most breathable on a dry cold day, and while it was a bit chilly during our hike, it was probably a bit too wet for much moisture to escape efficiently. After maybe a little over an hour at the lake, we turned around to head back down. Lake Twentytwo was much prettier than I thought, and I can see why it’s so popular. The wta takes great care of the trail, too. Nearly the entire thing was constructed by hand to make drainage efficient and avoid washouts and make it as level as possible. Definitely a good hike for the casual hiker, or families with younger kids. I bet it’s gorgeous in the summer. This entry was posted in Cloudy Days, Mountain Loop Highway. Bookmark the permalink. That was a great post. The smell of fresh cut wood. Things growing crookedly out of rock. Ferns growing out of moss growing out of ttrees growing out of earth.